Mathematical Physics in Theoretical Chemistry deals with important topics in theoretical and computational chemistry. Topics covered include density functional theory, computational methods in biological chemistry, and Hartree-Fock methods. 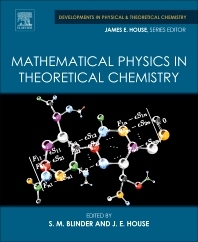 As the second volume in the Developments in Physical & Theoretical Chemistry series, this volume further highlights the major advances and developments in research, also serving as a basis for advanced study. With a multidisciplinary and encompassing structure guided by a highly experienced editor, the series is designed to enable researchers in both academia and industry stay abreast of developments in physical and theoretical chemistry. S.M. Blinder is a Professor Emeritus of Chemistry and Physics at the University of Michigan, Ann Arbor, and a telecommuting senior scientist with Wolfram Research in Champaign, Illinois. His research interests within the fields of theoretical chemistry and mathematical physics have included applications of quantum mechanics to atomic and molecular structure, theory and applications of Coulomb Propagators, structure and self-energy of the electron, supersymmetric quantum mechanics, and quantum computers. He is the author of four books and over 200 journal articles in theoretical chemistry and mathematical physics.